The first issue of The Reader in 2016 is here and it’s a very special one indeed as it heralds our sixtieth edition. There are plenty of diamonds to be found inside Issue 60, ranging from the brand new to the nostalgic, and the inclusion of our ‘One -Pagers’ – the raw, powerful and punchy moments from works of literature that make us feel alive and which we often turn to at times in need of affirmation. You’ll still find plenty of broader content within Issue 60, including new poetry from Carol Rumens, Julie-ann Rowell, Claire Allen and Vidyan Ravinthiran. The big themes of change and the future – still on many a mind as the year is fresh – feature in Gill Blow‘s story ‘Ladies of the Soil’, and Raymond Tallis seeks perspective on life from the imagined vantage of his future death in an extract from his new book The Black Mirror. Sitting alongside future thoughts are frequent glances back towards the past, as we republish poems by Les Murray and U.A. Fanthorpe from our earliest issues, and revisit our childhoods while keeping feet firmly in the present day as we talk to Jason Hazeley and Joel Morris, co-writers of the hugely popular Ladybird Books for grown-ups. Our second interview visits photographer Tim Booth, who talks about his stunning collection A Show of Hands – a collection of portraits of hands. Marjorie Lotfi Gill features in The Poet on Her Work, turning distance that feels like helplessness into clarity as she writes on the subject of gun violence. Charlie Darby-Villis writes about reading poetry in a high security prison, and the poet David Constantine responds with his own recollection of visiting HMP Low Newton. More on the particular power reading can offer come from pieces by Drummond Bone, Ben Davis, David Abrahamson and Claire Sive. All this alongside our Regulars and Recommendations – there’s much to celebrate in our latest milestone. If you’re keen to make a literary resolution for the year ahead, yearly subscriptions to The Reader begin from £24, offering four issues of the magazine. You can also purchase your copy of Issue 60 for the price of £6.95. There’s the chance of winning a full set of the Ladybird Books for grown-ups within the issue, so don’t delay in ordering! For more on The Reader, see our website. Last Thursday, our Merseyside based volunteers enjoyed a trip out to the Playhouse Theatre in Liverpool to see the play Rutherford and Son, a Northern Broadsides production, edited by patron of The Reader Organisation Blake Morrison. With excellent hospitality from the Playhouse and a wonderful performance, it was a great chance to thank our brilliant volunteers who give so much time and energy to their roles in admin, assisting in groups, and reading with older people as part of our Big Lottery volunteer project. Firstly I thought from the start the traditional nature of the play, and the introduction to the issues raised through the play were excellent! They confronted issues that may seem alien to some people, but in reality aren’t really that uncommon. Money for instance plays a vital role in our ability to survive in these harsh times, not only being able to food on our plates, but to give us a sense of importance and belonging we all crave. The play was originally wrote by Githa Sowerby in 1912 (who came from the North East) and was later edited by Blake Morrison for the purpose of the play. He stated that though Githa Sowerby was interested in creating a setting recognizable throughout the industrial north, she did not use real place names except in a solitary reference to the Tyne. He also stated that she was able to reflect the dialect of the working-class without making the language inaccessible to the modern audience or appear stereotypical of the time. The characterisations were acted and portrayed excellently both in context and in emotion. I loved the intensity of the performances and thought that the elderly widowed mother of the worker who stole from Mr Rutherford was my favourite character, but that doesn’t mean I thought the other characters weren’t portrayed properly, they were equally as driven and passionately about their retrospective roles. My Favourite Characterisations through the play, and my opinions on them! Rutherford: a man who epitomises a traditional man with traditional beliefs, whose only motivation is solely driven on maintaining the respect and foundations of the Rutherford name. He’s a hard working man who probably believed he was doing what was best for his family; after all was saying that all his hard work was to secure a future for his son. 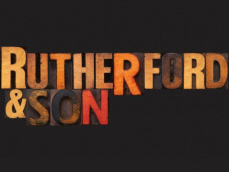 Rutherford’s Son: a man driven to succeed without the aid of his father, determined but a little naïve. He ‘s like most young lads with ideas about life and how he wants to be treated, but in the end it’s his naivety and lack of understanding that ultimately costs him his family, and his inheritance. Although I’ve only mentioned a couple of the characters in the play you can already see just how much I loved it. Thanks for a wonderful afternoon! 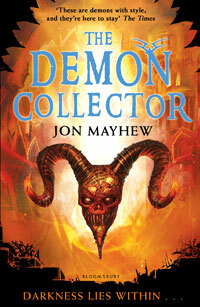 This Recommended Read comes from Melanie Squires, who has joined us this week on Work Experience, and who has become lost in the horrific and dangerous world of imagination and magic that is Demon Collector by Jon Mayhew. Jon Mayhew’s first book- Mortlock– was how I came to know his work. His horror genre and dark style were what caught my attention. As per usual, I was seemingly “without something to read”, which had always been my excuse to go looking for more material to lay my hands upon. I had known about The Demon Collector for a while, but with too little money and too little thought towards the subject, it had all but been forgotten to me. Therefore, seeing it on the shelf in the book shop, my curiosity for its contents and the desire to own it were sparked up again, and any attempts to buy anything else were futile. Edgy Taylor is a young, poor, orphan boy who has no company but that of a little dog, Henry, and a most unusual man- if he can be called a man at all- his cruel master, the Demon, even if Edgy himself is the only one who can see it. One cruel and cold night, he is barely saved from his clutches by the mysterious old man, who is known to the Demons as “The Stonemason”. He takes Edgy away from his home and to the Royal Society of Daemonologie, where there is an oddity behind every door. A young girl, who is most dead, resents him for taking her room. An Imp mistakes him for another young boy who had worked there, and who Edgy believes he might have watched die. With so many questions about himself and the Society unanswered, Edgy travels to the Arctic Circle, where he faces unknown terrors and a very possible death. With Demons willing to kill him and Society members unwilling to save him, how can he possibly survive? And will he ever know who he is, even if he is no one at all? This tale is filled with dark reality of Victorian England- the description really takes you back to that terrible time and shocks you with the ill fates of Edgy Taylor and other children like him. It is never dull and every new turn of the page makes you want to read on. Jon Mayhew, yet again, shows his fine ability to scare you while keeping you on the edge of your seat with interest. As well as simply being a good read, it does spark the imagination and questions the moral and religious beliefs we still have even today. Are Demons truly evil, or is it just the selfish nature of human beings to believe anything that could hurt them to be against all that is good? What is it that makes us any better than the Demons in our religions and mythologies? Personally, I could not help but think about these characters and this fantastic idea- an organisation which deals with the supernatural and the unusual in Victorian London. It was just an amazing concept and learning the “ins and outs” of the Society was one of many things that kept me reading. You could really feel the characters’ fear as they faced will all sorts of danger, even if their personalities were not as deep as I have experienced in other novels. All in all, The Demon Collector is a terrifying tale which holds your imagination hostage and drags it through a thousand adventures with horrors not just in the world of Demons and Hell, but also with the reality of Victorian London. It would be shameful to not recommend it. Two reading recommendations for the (non) price of one this week! This one comes very specially from one of the young people The Reader Organisation works with, a 12 year old girl who has been enjoying Wonderstruck, the new book by Brian Selznick with her project worker. Wonderstruck is phenomenal! I think it’s as good as The Invention of Hugo Cabret (Brian Selznick’s other book). The best thing about it is how the two main characters Rose and Ben meet across two different stories. Nearly every page has ‘wonder’ on it. The wonder is when those two meet, and the panorama Rose made. It’s interesting because there are two stories in one book. It’s about a boy called Ben who’s deaf and his mum dies, so he tries to find his dad. The other story is about Rose, who’s also deaf and she can’t talk. Her parents aren’t very nice and so she tries to find freedom. One of the stories is told in pictures and the pictures are amazing. You know what’s going on in the pictures but you don’t know how to explain it. They make you think. The story made me feel a bit sad and a bit happy. It was sad because the characters were alone and it made me happy when they all found each other. I was wonderstruck when I read it! 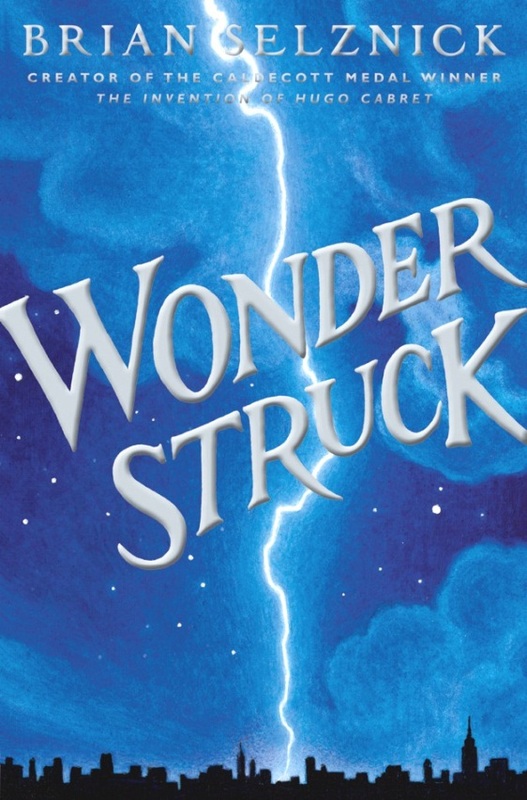 Wonderstruck, Brian Selznick, Scholastic (2011). You can get an insight into the story behind the story in an interview with Brian Selznick here.